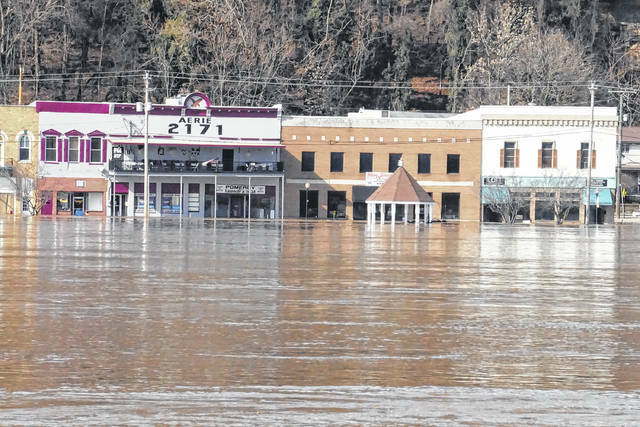 Flood waters caused damage throughout the region in mid-February, including in the downtown Pomeroy area. OHIO VALLEY — In the wake of last month’s severe weather and flooding along the Ohio River and its tributaries, Governor John R. Kasich has asked President Donald Trump for a Major Disaster Declaration so local governments saddled with infrastructure damage can begin the rebuilding process. Kasich issued an emergency proclamation Feb. 24 that ultimately included 20 Ohio counties. A joint preliminary damage assessment, conducted by local, state and federal emergency management officials in mid-March, documented damages to county, village and township roads, bridges and public buildings totaling $44 million. An additional $20 million in damages occurred to state highways. Thanks in part to previous mitigation efforts, an estimated $19.9 million in additional damages were prevented. Counties covered by Kasich’s request for federal assistance include: Adams, Athens, Belmont, Brown, Clermont, Columbiana, Gallia, Hamilton, Hocking, Jackson, Lawrence, Meigs, Monroe, Noble, Muskingum, Perry, Pike, Scioto, Vinton and Washington counties. In Meigs County, damage estimates from the February flash flooding as well as flooding along the Ohio River and Shade River is just shy of $3 million, although the numbers may change as repairs take place. Among the damage reported by the Meigs County Emergency Management Agency was $1.2 million by the Meigs County Highway Department, including damage to two bridges; nearly $550,000 in the village of Pomeroy; $404,000 in the village of Racine; and $178,000 in Orange Township. In total, 19 villages, townships, school districts and other government agencies reported damage in the county as a result of flooding. Meigs County also issued a local disaster declaration following the flooding in the county. On Wednesday, Ohio Senators Sherrod Brown and Rob Portman sent a joint letter to President Trump asking that he act swiftly in acting on the request of Kasich. “Severe storms and extreme rainfall last month in southern Ohio led to significant flooding, causing substantial damage to critical infrastructure, such as roads, bridges, and buildings. The State and local governments in the affected areas do not have the capability to sufficiently respond to this major disaster, and therefore, federal assistance is necessary to supplement the State’s recovery efforts,” wrote Portman and Brown in a letter to Trump. Gov. Kasich sends letter to President requesting a Major Disaster Declaration. Joint FEMA/Ohio Preliminary damage assessment begins with local officials, runs for four days. FEMA joint damage assistance team arrives in Ohio, meets with state officials. Ohio EMA makes request to FEMA for a joint FEMA/Ohio Preliminary Damage Assessment for Public Assistance. Ohio EMA facilitated the clean-up kits to Brown County. Ohio EMA facilitated delivery of 50 flood cleanup kits from the American Red Cross to Brown County. Ohio Department of Transportation (ODOT) sends a construction liaison to Scioto County. Ohio National Guard provided overhead imagery along the Ohio River in Brown, Clermont and highland counties with air lift provided by the Ohio State Highway Patrol. Ohio Department of Health (ODH) helped acquire 100 doses of tetanus vaccine to Brown County. Ohio Emergency Operations Center moves from partial activation to assessment and monitoring; Joint Information Center closes. ODOT geologists are on the scene in Lawrence County to clear a large rock slide on State Route 7. ODOT is working to procure contracts to remove the boulders. Ohio Department of Job and Family Services authorized $150,000 in Temporary Assistance for Needy Families (TANF) Disaster Assistance funds and $25,000 in Adult Non-TANF Disaster Assistance funds for the elderly and disabled. Ohio Department of Natural Resources (ODNR) delivered a truck-mounted water pump to Lawrence County. Ohio EMA provides damage assistance guidance to county EMA. ODOT provides visual message boards and traffic control; OSHP assisting ODOT with traffic control. State of Ohio Emergency Operations Center and Joint Information Center open. Ohio EMA sends staff to five county EOCs as liaison officers. Governor Kasich issues proclamation declaring state of emergency. ODNR delivers water pump to Proctorville in Lawrence County. Ohio EMA provides 3,000 sandbags to Athens County. ODNR pre-positions swift water rescue team. Department of Aging and four Area Agency on Aging provide meals to elderly. Ohio EMA provides 2,000 sandbags to Athens County. State agencies prepare all equipment to ensure they are ready when needed. Ohio EMA provides flood safety messaging to county EMA directors for dissemination. ODNR reaches out to affected counties. Gov. Kasich directs execution of the State Emergency Plan: Ohio EMA Watch Office transitions from daily operations to assessment and monitoring of minor state and local partners and holding coordination calls with National Weather Service. Information provided by the offices of Gov. John Kasich and Senators Sherrod Brown and Rob Portman. Sentinel Managing Editor Sarah Hawley contributed to this report.